Baltimore Ravens quarterback Joe Flacco connected with wide receiver Mike Wallace for a one-yard touchdown in the final minute of the fourth quarter, but his last-ditch effort wasn’t enough to pick up the win against the Tennessee Titans. The Titans’ 17 first-half points and quarterback Marcus Mariota’s 11-yard touchdown strike to veteran wide receiver Eric Decker in the final frame were enough for Tennessee to pick up the 23-20 win over Baltimore on Sunday. Mariota completed 19-of-28 passes for 218 yards and two touchdowns against one interception on the day, picking up the pace for his underwhelming backfield. Titans running backs DeMarco Murray and Derrick Henry combined for just 45 yards on 17 carries (2.64 YPC) against the Baltimore’s stout front seven. Ravens veteran safety Eric Weddle was the man behind Mariota’s sole interception, as he picked off the third-year signal-caller’s pass in the fourth quarter to give his team a chance to stay in the game. However, Flacco’s two fourth-quarter touchdown passes were too little too late. He finished the game with 261 passing yards, two touchdowns and two interceptions. He did have a poor interception to Eric Weddle on an overthrow that almost allowed Baltimore to get back into the game, but this was once again another efficient performance from the former No. 2 overall draft pick. He found success throwing the ball downfield, completing 4-of-7 passes for 93 yards along with a touchdown and an interception on throws traveling 20-plus yards in the air. Walker was a game-time decision, but the Titans, and Mariota, in particular, were delighted to see him on the field, as he came up with several big catches. Playing just 21 passing snaps, he averaged 3.67 yards per route run, and he showcased soft hands with zero drops on the day. Casey played a pivotal role in the Titans allowing just 0.81 yards before contact to the Baltimore running backs on Sunday afternoon. 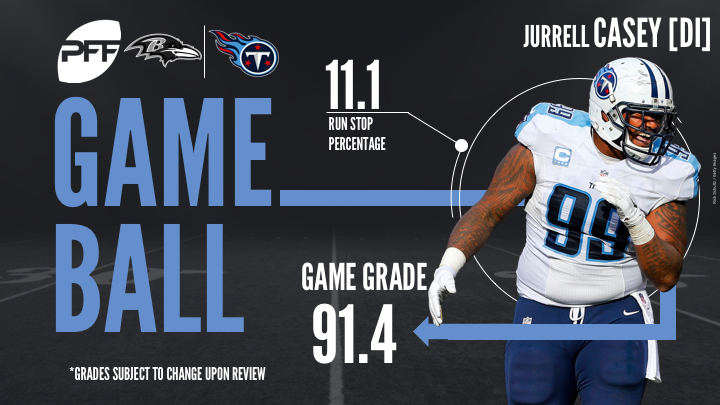 The Titans’ star interior defender dominated Baltimore’s interior offensive line, as he earned a run defense grade of 92.6. Furthermore, Casey also picked up two pressures, including a sack, on 44 pass-rushing snaps. Woodyard led the Titans with seven defensive stops on the day, and he did not miss a single tackle. His most notable run stuff came in the fourth quarter when he tackled RB Alex Collins for no gain and forced Baltimore to turn over the ball on downs. Woodyard excelled in pass coverage as well, allowing just 33 yards on eight targets and even breaking up one of those attempts. Maclin, once again healthy, proved why the Baltimore offense needs him so much. The former Kansas City Chief led the Ravens in receptions, as he hauled in eight of his nine targets and gained 98 yards, only 10 of which coming after the catch. He was all over the field, as his eight receptions came against seven different Titans defenders. QB Joe Flacco had a passer rating of 112.0 when targeting Maclin in this game. Even though Flacco got good protection and was under pressure on just seven of his 54 dropbacks, he did not attempt to attack the Titans defense vertically as frequently as it might have been expected based on the protection. Of Flacco’s 47 aimed passes, only 13 traveled at least 10 yards in the air. He attempted just four passes beyond 20 yards from the line of scrimmage, but neither were completed and two of these attempts were picked off, as he had a passer rating of 0.0 on these throws. The Ravens continued to bring Humphrey along slowly, but their first-round draft pick out of Alabama continues to flash when he gets on the field. He played just 18 snaps against the Titans and just 12 in coverage, but he didn’t allow a catch on the two throws where he was the primary coverage defender and came away with a pass breakup. After allowing 29 yards on the opening play of the game, Smith allowed just two receptions for 12 yards the rest of the way. That reception had a big impact on his NFL passer rating allowed in the game, coming in at 86.3, with Smith leading the NFL at 24.5 coming into the game. This performance pushed that to 34.5, which is now second in the NFL behind New Orleans Saints rookie Marshon Lattimore.